Need to store your tokens away from other coins in your pocket or bag? Our colourful cotton storage bags are ideal for holding your tokens. Available in a range of bright colours, these drawstring bags measure 10 x 13cm. Great for teachers to store house point tokens in to give out to children outside the classroom or for head teachers to store their star shaped tokens. Not what you’re after? Contact us: 0114 261 1196 or sales@tokensfor.com. 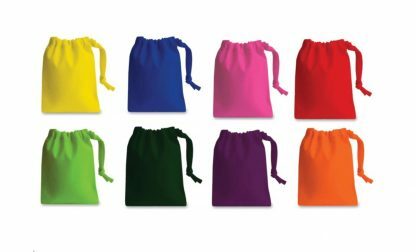 If you require these drawstring bags for a particular date please add the date to your order notes and we will endeavour to meet your deadline.